Brought to life in this one-of-a-kind book are the heartwarming true tales of 20 unforgettable animals that helped Anzacs serving in WWI and WWII. You'll meet well-known animals, such as Murphy the donkey, who carried the wounded in Gallipoli and Caesar the Red Cross Dog. But also included are the hard-working horses, camels and mules, and the dogs that barked a warning when enemy planes were approaching, as well as the mischievous monkeys that had the men laughing. From the winning team of the 2016 Supreme Book of the Year Award. Watch a book trailer video here. Teaching resource here. Maria Gill and Marco Ivancic also learnt this month that their Abel Tasman: Mapping the Southern Lands book had been selected as a 2018 Storylines Notable Book (non-fiction). Maria Gill's book with Gavin Mouldey Toroa's Journey was also selected as a 2018 Storylines Notable Book. Read an interview between authors Glyn Harper and Maria Gill about researching their animal war stories here. 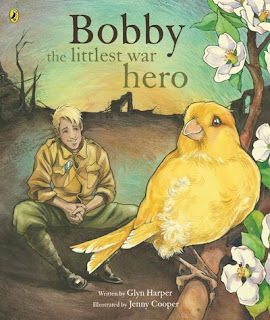 A tiny canary called Bobby best friend Jack is a soldier for the Royal Engineers' tunnelling company. Together they go deep into the tunnels under no-man's-land. Jack's job is to dig, while Bobby's job is to warn the men to get out quickly when there's dangerous gas. Bobby's warnings save the tunnellers' lives again and again. 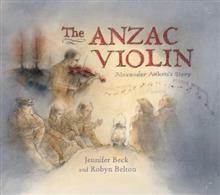 Glyn Harper and Jenny Cooper are the award-winning creators of bestselling picture books about WWI: Le Quesnoy; Jim's Letters; Roly, the Anzac Donkey, and Gladys goes to War. Anzac soldiers huddle in their dugouts, sheltering for a moment in this place so far from home. In the midst of the fighting, the music of a violin swirls around the weary men, shifting their thoughts back to summer picnics and happier times. Also congratulations to Fifi Colston and Jennifer Beck for their book Torty and the Soldier being selected as a 2018 Storylines Notable Book.